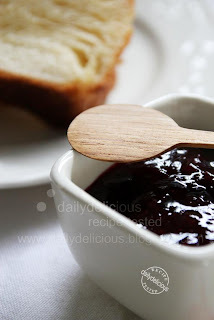 dailydelicious: Chicken Farm Baker's Project # 26 : Jam and bake .... spoil yourself with mouthwatering jam. 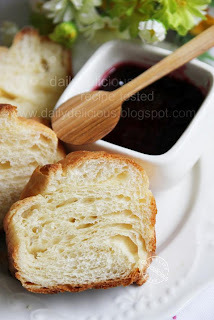 Chicken Farm Baker's Project # 26 : Jam and bake .... spoil yourself with mouthwatering jam. For this month, we don't only bake, but we make a jam too. Due to the fact that my friend who live in Italy, have to make jam every years, she has an idea that we should try this kind of art too. It's the beginning of this project :Chicken Farm Baker's Project # 26 : Jam and bake .... spoil yourself with mouthwatering jam. As always, I have no idea, haha, what I should do. Because I rarely make a jam by myself (well, I have my love for seedless raspberry jam but it's easier to buy than making it, ^^). Anyway, I have to make one jam, and luckily I got a box of pectin from one of my friend (Khun Naung, she sent me a box of it after knowing that I didn't have it ^^). So this is a chance to use it, right? 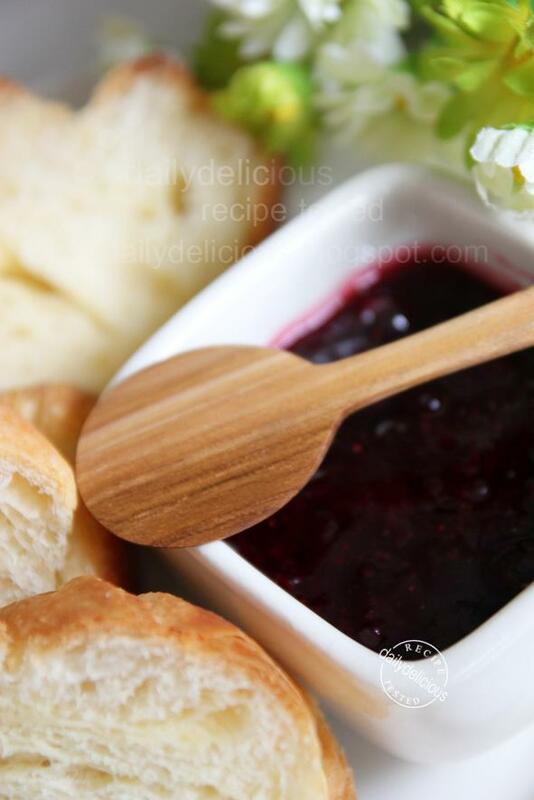 I read the instruction inside the box and saw this recipe, the strawberry and blueberry jam, I think it's a good one to try. The first batch is a disaster, >*<, because I reduced too much sugar from an original recipe, and the jam didn't set, it look like a soup, haha! So, I have to do it again, this time I reduce only 30% from the original recipe and boil it longer. It's a precaution for anyone who want to make jam, if you want to use less sugar, you may have to buy the pectin with the label like "less sugar" or your jam won't set at all. But if you don't use any kind pectin, you may have to boil the fruit longer to thicken it. 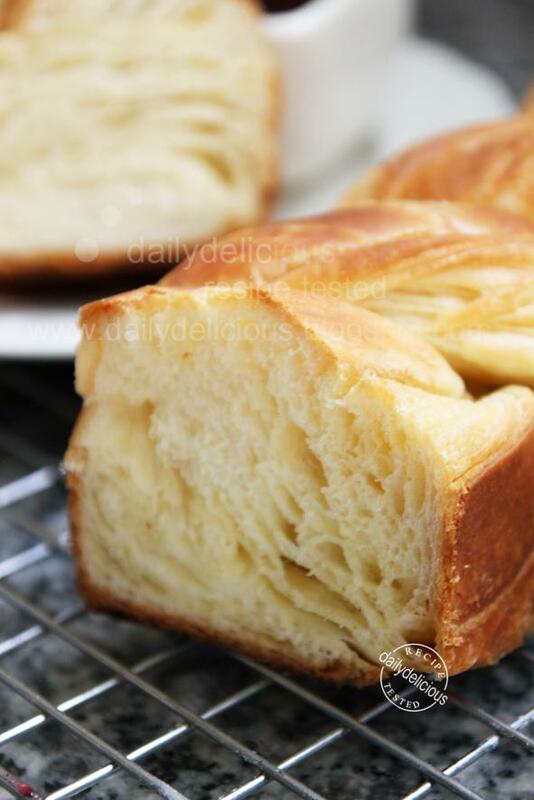 For the bake, I choose to make Danish loaf, the one that I had tried it when I went to Singapore last year (so sad that this shop was gone), and I really want to make it ever since. I saw an easily recipe for making Danish loaf in Japanese website (actually it's a shop website, they give the recipe for promote their product). 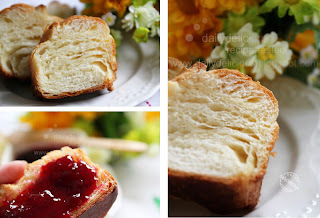 I think it's a good recipe and very easy to follow, the results is quite good and the preparing time is shorter than other Danish bread recipe. 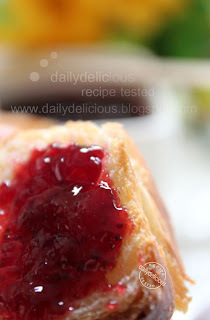 So, this is my Jam and Bake, a delicious and easy to make Danish loaf with sweet and fragrance Strawberry and blueberry jam, that I hope you will love them too. Crush the fruits with potato ricer (don't puree it), and put them in the saucepan. Pour the sugar and lemon juice into the pan and bring to rolling boil for 5 minutes. Pour the pectin into the pan, stir quickly and bring to rolling boil for 5 minutes. Pour the jam into clean box (or sterilized jar if you want to keep it for a long time). 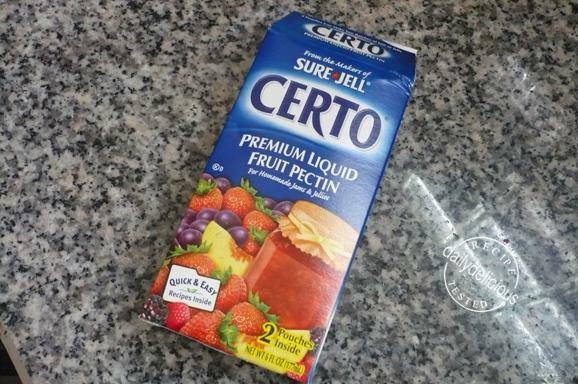 Note: If you don't have pectin, you may have to boil it longer to thicken it. Mix flours, sugar milk powder and yeast together, put the salt into the bowl and whisk to combine. Pour the water and egg yolk into the bowl and mix to combine. When the dough is moisten, take it out of the bowl and knead until smooth. Knead the butter into the dough. The dough will be soft and smooth, but will be a bit sticky. Let the dough rise in room temperature for 20 minutes, then refrigerate for 15 minutes. Roll the dough into 20x20 cm square and place the butter on the dough, cover with the dough and seal it. Start by pressing down the dough with the rolling pin before rolling the dough into a rectangle 1 cm thick ( to prevent the leakage if the butter). Roll the dough into rectangular about 35-40 cm long. Give the dough the first single turns by fold the bottom third of the rectangle up toward the centre, carefully aligning the edges. Fold the top third down to make a neat square and brush off any flour. Refrigerating it for approximately 30 minutes. Be sure the dough is well covered at all times. Roll the dough again into rectangular about 35-40 cm long. Give the dough the second turns by fold the bottom third of the rectangle up toward the centre, carefully aligning the edges. Fold the top third down to make a neat square and brush off any flour. Refrigerating it for another 30 minutes. Butter the pans and set aside. 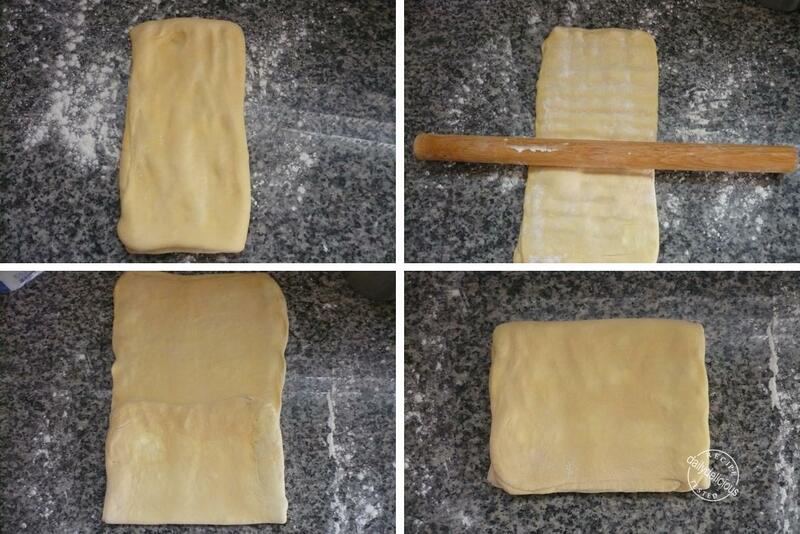 Roll the dough into 30x30 cm square, and cut the dough in half. Roll each half into a cylinder then cut the cylinder in half. Twist the ropes together to form a rope. Put the rope into the pans, and let rise in room temperature for 1 hour. This one is calling out to me! 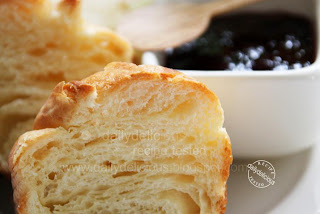 is it possible fo me to make apple dannish from this recipe? if yes, to what degrees do i have to set the temperature of the oven? and for how long? you can use it for making Danish but you may need to fold 3 time (in this recipe you fold only 2 and roll the dough instead). The baking temperature will be 180C, and baking time will be about 15-20 minutes(a small one) or depend on the size of your bread.